Our grandfather, George Beretta fastened the jalousies and shutters and made his last-minute preparations. 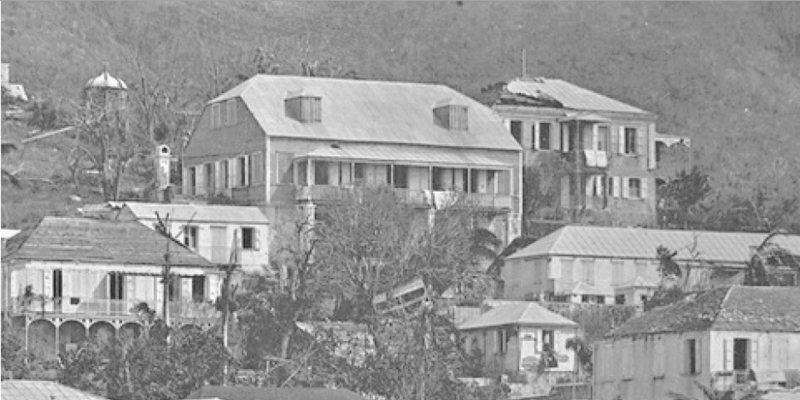 The Berettas hunkered down in their family home, Crown House in Charlotte Amalie, with wind speeds ‘reckoned at approximately 125 to 140 miles per hour’. The wind battered the house throughout the night and into the next morning. October 9th, 1916 was the date of this hurricane, the worst that the Danish West Indies had experienced since the catastrophic hurricane of 1867. Crown House, located at Dronningensgade 26-27 just below Blackbeard’s Castle, was reportedly built in 1740. If true, this would make it one of the oldest buildings in existence on the island of St. Thomas. 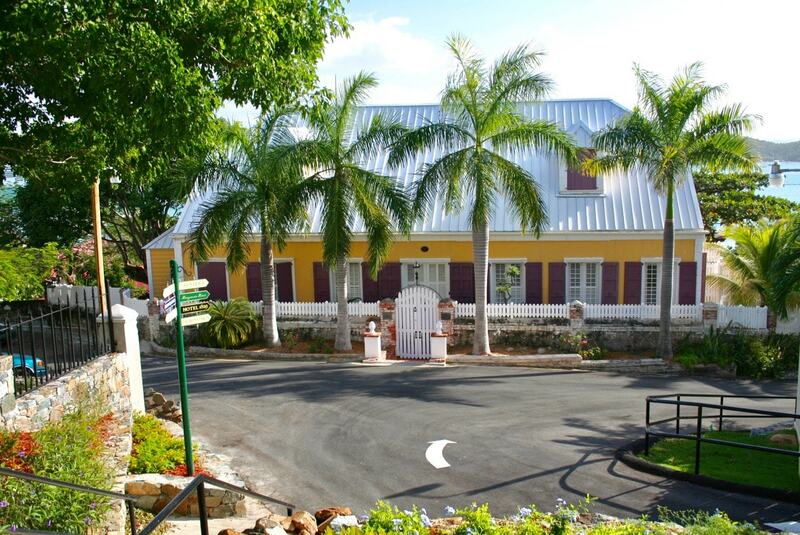 It was called Crown House because two previous owners in the 1800’s served the Danish Crown as governors for St. Thomas. The more famous, Peter von Scholten, owned the house from 1817 to 1821 and wrote a lucid account of the hurricane of 1819 as experienced by him from this house. During that time, the home was the center of island culture and official hospitality. 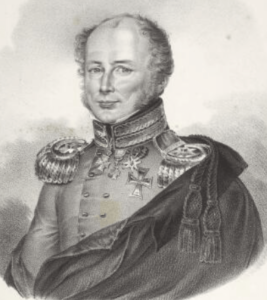 Of course, we know von Scholten best for being the Governor General of the Danish West Indies who declared Emancipation on July 3, 1848. The Beretta association with Crown House came much later when our great-grandfather, Giorgio Natal Beretta bought the house in 1899. Being a merchant and shipowner, the location high on Government Hill offered Mr. Beretta a great view of the St. Thomas harbor, so important in his trade. This elegant house became the family home. 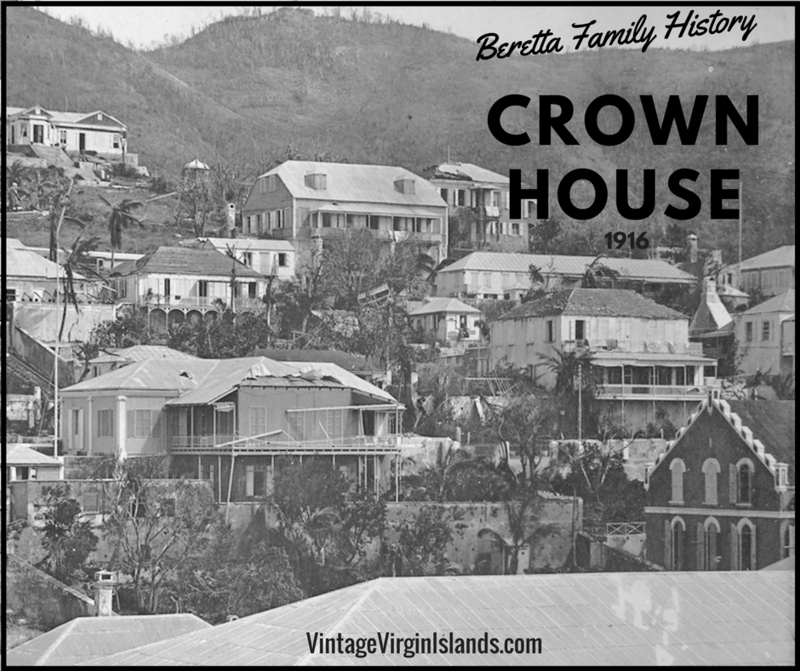 One hundred years ago, the Beretta family owned several houses, many used as rental properties, but the jewel was their home, Crown House. The news accounts of the 1916 hurricane detail the destruction in the harbor, ships being tossed up on land or sunk, and damage to the West Indian Co. dock and cranes. Many trees were torn up and there was damage to a majority of the houses and buildings in Charlotte Amalie. A photograph of the Government Hill area, taken in October 1916 shortly after the hurricane, shows many houses such as ‘Quarter’s B’ and ‘Lutheran Parsonage’ with substantial roof and structural damage. The adjacent Crown House survived the hurricane relatively unscathed. Shortly after the hurricane of Oct. 9, 1916, which severely damaged the Paiewonsky home on Synagogue Hill, Mrs. Victorine Beretta, widow of Giorgio and a close friend, invited our family to occupy the ground floor of No. 26, Kings Quarter [Crown House] until our damaged home was restored. We spent almost an entire year at the Beretta house, unaware at the time of its historic importance. We were residing there, March 31, 1917, when the Danish islands were formally transferred to the U.S., and we parents and children, witnessed much of the harbor activity from the strategic vantage points of No. 26, Kings Quarter. 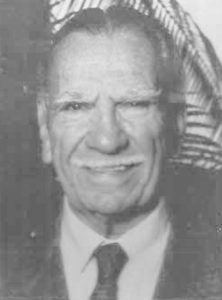 Later, Mr. Isidor Paiewonsky would become well known for his research on Virgin Islands history. He also moved to Government Hill living for many years just two houses down from Crown House at 24 Dronningensgade. The hurricane and its aftermath, including his stay at the Beretta home and Transfer Day, made an indelible impression on young Isidor. The hurricane of 1916 was destructive and devastating, but islanders rose up from the adversity. The story of our Beretta ancestors at Crown House 100 years ago is one of compassion, strength, and resilience. Peace and Blessings to my family and all my Virgin Islands’ compatriots who recently rode out Hurricanes Irma and Maria. VI Strong! 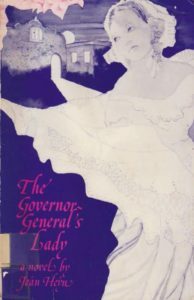 An account of the hurricane of 1916 is found in Zabriskie, Luther: The Virgin Islands of the United States of America (New York: G.P. 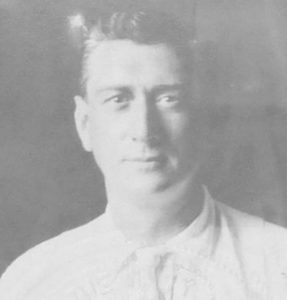 Putnam & Sons, 1918). Paiewonsky, Isidor, “Crown House”, ‘History Corner’ The Daily News, St. Thomas, Virgin Islands, 28 Oct 1975, p.9 & 19. Petersen, H.: ‘Blackbeard’s Hill after the Hurricane’, Oct 1916. 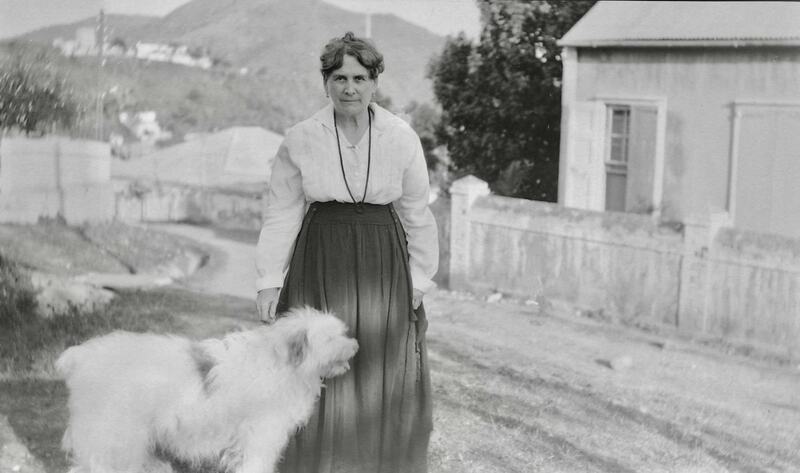 (This photo was sent to me courtesy of Peter Kelstrup, a Dane, who in turn got it from his cousin Dorrit Tarstrup- they are both descendants of the Riise and Petit families of St. Thomas and this was a photo that they did not know the significance of. It was taken by Heinrich Petersen who also did Transfer Day photographs- note the ‘H.P. 1916’ in the lower right-hand corner. I moved to the islands for the beaches – yet fell in love with the history and the vitality of the Caribbean culture. Stayed for 16 years and loved every minute on every island. I miss island life everyday and I pray for their recovery from the scourge of these storms. VI Strong.